I've not been feeling that good since the past few weeks. My health pun not very good (style demam tak demam yg sgt la menyakitkan hati, baik la demam teruk sekali gus rather than demam skit² for 2 weeks) and my mental health pun agak tunggang langgang due to some things I'd rather keep to myself.. Anyway, I was feeling a bit sorry for myself and all that but then I realized, this week hasn't been all blues and greys. In fact, I've found time to actually be amused and laugh a bit here and then. Monday: Had my form 1 class in Pt Buntar (my one and only form 1 class.. klau tak, beratur je kelas form 1 sy.. syukur la sgt sikit je tahun ni hehe..) I was laughing along with my class when outta the blue, one of my students declared "Besar nnt sy nak ngorat cikgu tau!" What embarassed me the most was that, instead of laughing it off, I found myself blushing furiously to the delight of my students who started teasing me endlessly hahah.. adoi laaa Ayu! 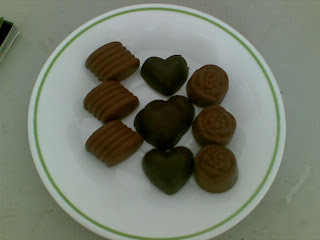 Tuesday: Went to Honey to buy some chocolate moulds for my cousins wedding. 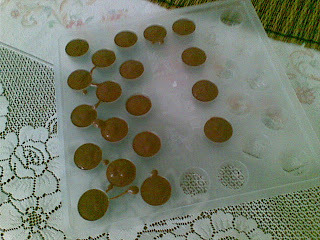 The moulds cost only about RM2.80~RM3.50 each and I bought TWO.. only TWO! Know what I was charged? ..and I couldn't help myself from laughing out loud at the cashiers look on her face when she looked at the receipt! Wednesday: I met two of my exstudents in Watsons and when they got home, they started reenacting the act of me singing in my car! Aiyakkk.. kantoi la plak ngan diorg but I couldn't help laughing at them as they teased me senselessly.. aishhh, miss those guys! Thursday: Went about doing the chocolates for Intan's reception and was thoroughly amused when I looked at the outcome.. yup! 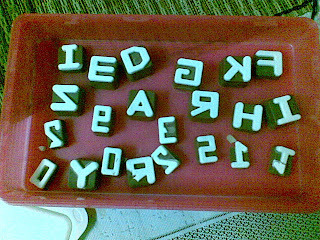 My chocolates turned out to be kinda upside-down-inside-out when it came to the letterings.. faulty moulds (The ones that cost me RM70 000++ tuuuuu..) Hahaha..
Friday: Well, today I'm gonna be busy with cupcakes and cookies for Intan.. but I'm not gonna miss the wedding of the decade, am I? Its been a bad week for me.. Finally, I did something I've been meaning to do for months now but the relieved feeling I was hoping for still hasn't shown up and I'm feeling a bit worse at the moment but my guess is, this is better than what I've been feeling (or trying not to feel) these past few months.. eventhough deep down inside, I know I'm ruining something beautiful and something thats been so meaningful in my life.. 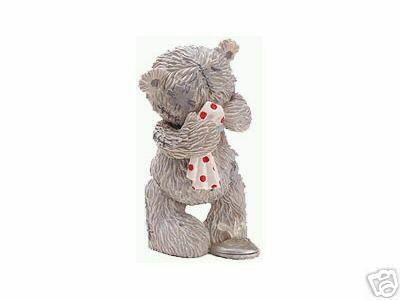 Believe me, I wouldn't have wanted to let it go..
Gosh.. why can't I stop crying?!? I wish so much to talk to someone about it but I can't bring myself to do so. I've tried talking to my brother, but the lump in my throat just gets bigger, chocking me of the things I wish I could just let out. I tried talking to a dear friend, but found myself tongue-tied whenever she asks me about it and last night I tried talking to a dear ol' friend who has always been my shoulder to cry on.. but I just couldn't.. I keep wishing I could clarify things with the person involved but I know I'm too much of a coward for it. 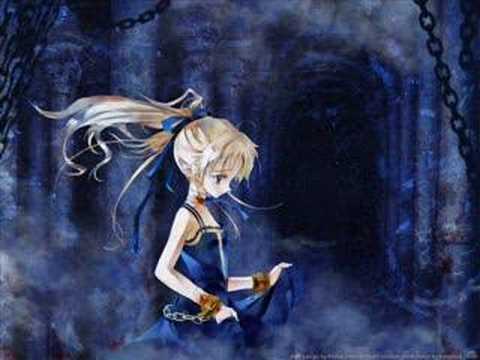 I just hope I'm not making things harder than its supposed to be..
..and I wish I'd stop being such a broken dam! Ni yang tak suke bile demam ni..
..mule la bende kecik pun bleh bagi 'hujan' turun..
Latest project yg dah berminggu la jugak buatnye hehe.. Okay.. mmg sgt berabuk la ini bloggg.. aissshhh, sape la tuannye kan? Hmm.. nak tulis ape ye for spring cleaning of this blog? =p <--ngade kan! I've had a lot of projects on my mind. Mmg jenis pantang tgk org len buat, sendiri pun nak buat jugak.. Hasilnye, bnyk bende terbengkalai.. aissshhh! But for this year, I've one personal project yang udah pun berjalan.. yeay! Wpun baru sekali je try buat and sudah ala² patah ati (?) tp at least dah mule kan.. and whats the project for 2011 ini? Jeng³..
Ok la.. sape yg dah bese buat mmg tau la you don't actually make the choc from scratch la kaaaannn so tak leh la nak bangge sgt cam cupcakes tp ok laaa.. seronok jugak! Maka, terkubur la sekejap kehendak ku itu..
Then sembang with Diana plak about choc and she gave me the same theory. The thing we had in common then haha.. sbb time tu Diana pun lum amik kelas but she already bought the moulds and everything dan tertayang la di FB nye yg tleah membakar kembali semangat sy nak buat choc. Pastu ngan Yaya pulakk.. Minah kecik ni sgt semangat la buat choc. Rasenye baru 2-3 days after her first class, dia dah bukak tempahan. Waaaahh.. tabik spring kak Yong kat Yaya ni and she also shared her own tips in chocolate making as well as memberi semangat kat kak Yong dia ni untuk meneruskan niat murni dlm pembuatan choc..
Balik rumah, tgk je bende² tu sbb still mcm takde confident wpun ati dah membara je nak buat hehe.. then Diana yg baru balik from her class plak kasik a new tip in the filling yang senang skit dr Yaya punye (tp Ya punye kak Yong nak try gak) so terus je ke Swee Ching sekali lagi and beli orange choc dip and half block of dark choc hahah.. boley? Anyway, I'm hoping for a few more tries. This one, ntah, maybe sbb I was hoping for Cadbury-like taste kot sbb tu tak puas hati <--berangan je lebey kannnn. Next time gonna try ask around for other methods ke ape ke and gonna try them. Thanx to Aina, Yaya and Diana jugak sbb sudi jadik cikgu chocolate sy~♥ Bile nak terre cam korg pun tatau laaa kannnn.. but thanx!